Thanks to Meridith McNeal for including me in “Word” at the Rush Philanthropic Foundation’s Corridor Gallery in Brooklyn (334 Grand Avenue; G or C train to Clinton-Washington Avenues). Curated by Meridith McNeal, with work by Sameeh Alderazi, Dennis Buonagura, John Casey, David Camacho, Cecile Chong, Ernest Concepcion, Carrie Cooperider, Giuseppe Di Lelio & Meridith McNeal, Yolanda Gonzalez, Damond Jaynes, Hawley Hussey, Meg Hitchcock-Steger, Glenn Ligon, Iviva Olenick, Gabriel Pacheco, Marie A. Roberts. On view through October 28, 2012. “Threads.” 2012. Embroidery with fabric collage. 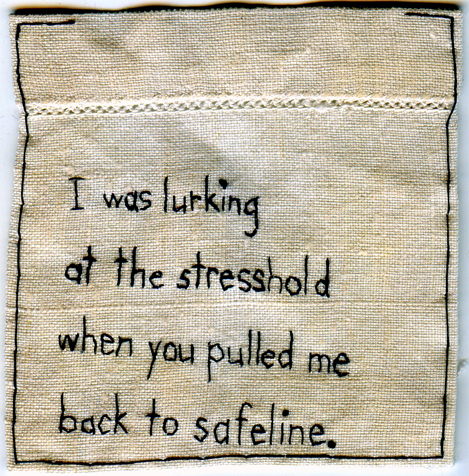 “I was lurking at the stresshold when you pulled me back to safeline.” 2012. 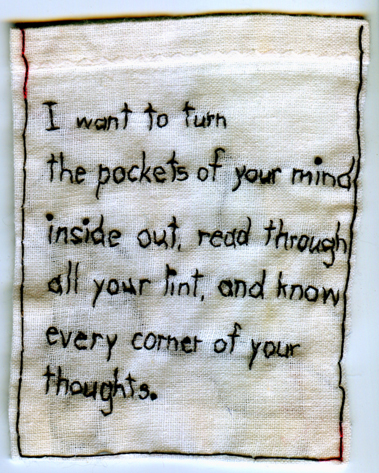 Embroidery on fabric with invented lexicon, inspired by a literary reading. 3.25×3″. 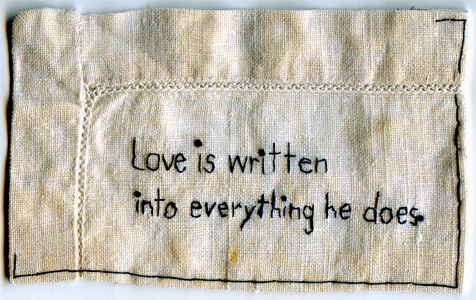 “Love is written into everything he does.” 2012. Embroidery on fabric. 2.5×4.25″. “Your Thoughts.” 2012. Embroidery on fabric. 3.75″ x 2.75″.